Delicious deep fried foods, fast and easy. 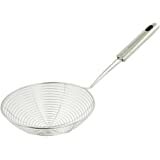 Uses just six cups of oil and maintains perfect frying temperature automatically. 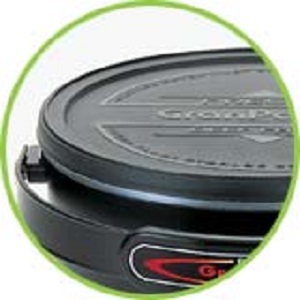 Snap-on lid stores oil to use again and again. 120 volts, 60 Hz only. Sporting a fresh look, this stylish deep fryer is super for sizzling up crunchy chicken, golden French fries, crispy onion rings, and more. It quickly fries six liberal servings with only six cups of oil. The perfect frying temperature is maintained automatically. 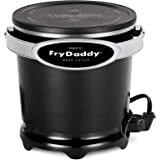 The fryer is constructed of heavy-cast aluminum and features a nonstick surface, inside and out, for no-hassle cleaning. 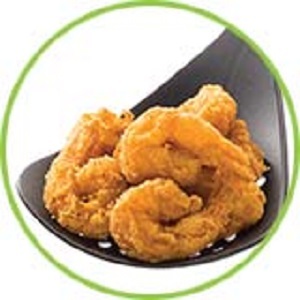 A snap-on lid allows oil to be stored in the fryer to use again. Slotted scoop included. One-year limited warranty. Stores oil to use again and again. Saves money on oil! 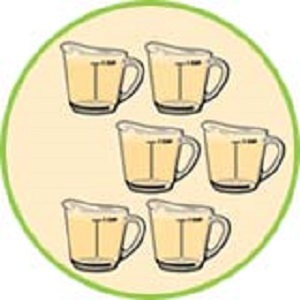 Uses just six cups of oil to make six big servings. Quickly shipped with tracking provided in Canada. Well packaged. The best deep fryer for home/family use. My mom's had one for many years now and I now know why. 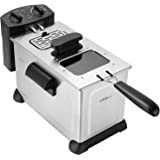 Easy to use and store away as compared to the bigger heftier oil fryers out in the marketplace. This heats up quickly every time and fantastic for cooking. It has no temperature regulator so you cannot set temperatures. However. Very easy to clean and dump out used oil. The cord is attached at the base magnetically so you can detatch the cord also for easy storage. It comes with a plastic lid on top. Bottom line since it is such a simple unit it works wonderfully. "The secret to good fried chicken is a real crisp skin.This is a great little fryer, but with chicken you need an extra yet worthwhile step to have the best fried chicken you ever smacked your lips around. This fryer does that but not if the bone-in chicken is raw, the temp of this fryer is too high for raw, bone-in chicken and what happens is undercooked chicken, even legs. But there is a way to get around that and it makes the chicken much better anyway. What you need to do is place the pieces of chicken you want to fry in a pot, cover with cold water, add salt to taste and, what I like is a healthy dose of Tabasco sauce. Enough to change the water color and to smell its aroma. You can use whatever herbs or spices you want to impart in the flesh if you like. Bring the cold water with chicken and flavors to a boil uncovered. Once it comes to a boil, remove the chicken, do not boil too long. Let it sit out to dry, it only takes a minute or two for the hot chicken to dry itself, Then, however you want to coat it, I dip the chicken in buttermilk and then flour. Let that sit at least fifteen minutes, as long as it does to let the oil come up to temperature, this gives enough time for the buttermilk and flour to adhere, making less mess in your oil and a better crust. Fry three pieces at a time if you like but no more, it doesn't take long to bring it to a beautiful golden color. Place it on a rack, never on paper towels to drain, that will keep your chicken crisp on both sides. Once cooled slightly, plate it and you'll have yourself some real good fried chicken." Love the new GranPappy. Does a batch of french fried potatoes golden brown in 4 minutes. Also made deep fried chicken but found it over browned the batter if left in the fryer long enough to cook the chicken through. About 4 minutes in the deep fryer and then finish them off at 350 degrees in the oven until the chicken comes up to 180. Delicious. 5.0 out of 5 starsVery easy to use. We only used once so far, but super simple, fast heating. Ours heated to between 375 to 379 degrees F.
The only negative was our oil choice. We bought Avocado Oil, thinking good for over 400 degrees, but we did had some slight wiffs coming up from the oil, like the temperature reaching the start of overheat for the oil, which is another added level of unhealthy. So some oils say higher temp but for sure you have to find a good high temp oil. There are only a few types that can reach these temps without smoking. But this is a very simple easy unit to operate. 5.0 out of 5 starsEasy to clean and I feel safe using it. 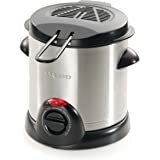 I have always avoided deep fryers as I felt they were dangerous but my husband loves french fries and using other methods to give him his favourite wasn't making him happy so I broke down and bought this deep fryer as I use lard I render down myself and he is happy and I don't feel I am going to get burned. 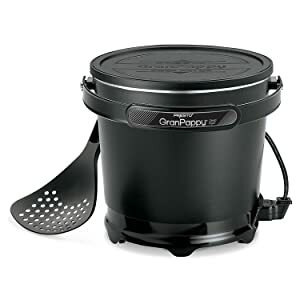 5.0 out of 5 starsThank you to all who wrote favourable reviews of the Grand Pappy Deep Fryer. I bought this product after reading customer reviews on Amazon. 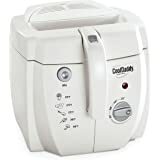 I was looking for a replacement for a very old deep fryer. 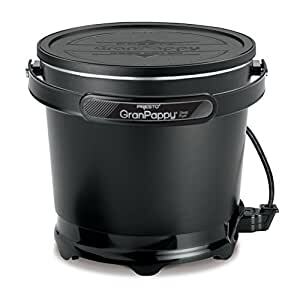 I have now used the Grand Pappy Deep Fryer three times and I couldn't be happier with it. I have fried enough fried chicken for a family of five for dinner. 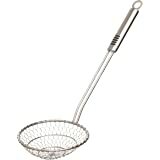 It cleans up easily; it transports easily and it fries quickly and crisply in not all that much oil. It stores the oil with the lid on so it is ready for the next use. I find it so much easier to use than the larger frier I had used previously. A very good value for the money for small to medium batch frying.